As much as we’d like to, not all of us can turn up to poker games like high rollers ready to spend thousands of dollars on a whim. Sure, that’d be a lot of fun but as the average UK household earns around £68 per week to spend on recreational activities, that’s simply not a possibility for many of us. On the other hand, you may have the extra money to invest but simply don’t enjoy the higher levels of risk and anxiety that can accompany high-stake games. Regardless of your reasons, nothing should stop you from playing poker if it’s one of your favourite pastimes. Instead, you’ll simply have to play on a budget and fortunately for you, we’ve come up with a guide on how you can do precisely that. 1. What Are Low-Stakes Poker Games? Whether you’re playing online or live poker, most games and tournaments require each individual player to buy a seat at the table. The amount charged is known as the buy-in and can differ in price significantly. For example, big, prestigious tournament events such as the World Series of Poker Main Event charge $10,000 while smaller affairs will cost a lot less. In the world of poker, the terms low, small, micro and minor stakes refer to cash games that require a small buy-in. These low-stakes games will also require players to place far smaller wagers than what would be expected during medium or high-stakes tournaments, often ranging from pennies up to £100 at the most. In live games, this can often mean that the prizes are far smaller than they would be in high-stakes games. Though, online there are still quite a few outlets willing to reward low-stakes players. This is even true of free poker games and tournaments, which can be found all across the web. These games are perfect for anyone who has just entered the world of poker or those who don’t have the extra cash to invest in online games. Unfortunately, while these games are great value, more experienced players may find them a little testing as there will be a lot of newbies in there honing their skills. Still, if you think you can put up with this, they’re a great alternative to even the lowest of low-stakes games. 2. How Do Low-Stakes Poker Games Work? If you’re ready to enter straight into the world of low-stakes poker, then there are tons of open seats just waiting for you to join. Upon entering, whether it be online or off, you will be asked to deposit your buy-in in exchange for a specific amount of chips. From there, the low-stakes game will proceed much like any other poker game, just expect the wagers to be a lot smaller than those in the tournaments you may have watched on TV or online. Just because your buy-in and wagering limits are small doesn’t mean you can’t win big though. 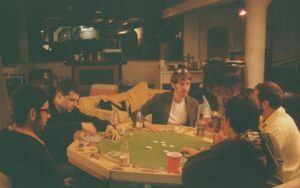 In fact, many of the world’s top poker players began by playing low-stakes games, including Cliff Josey (Johnny Bax), Shaun Deeb and Chris Moorman. These players are known as ‘grinders’ due to their low-risk, tight poker playing style and each of them has managed to make quite a lot of money despite rarely dropping ridiculous amounts of cash on games. As to whether you can do the same, according to 888poker, this depends on two things: your bankroll (the total you’re willing to invest in poker games) and your skill level. For example, say you’re looking to play Texas hold’em, then you will first need to find a game that your bankroll can cover and that your skill level is up to par for. When it comes to skill levels, this is entirely up to you and relies solely on self-assessment. The bankroll issue, on the other hand, can be calculated pretty easily: you should have at the very least enough money to pay the buy-in 25 times over. So, if you have paid £50 to enter a game, then you should have at least £1250 to spend in total. If your total bankroll is £50, though, then you should be looking for £2 buy-ins, which you’re far more likely to come across online than in the real world. 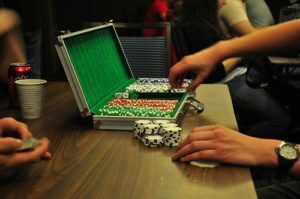 Speaking of where you’re likely to come across low-stakes poker games, if you’re looking to play live games, then your local neighbourhood may already have a games night set up that you can get involved in. Alternatively, you yourself may want to consider organising a poker night where anyone can join in with low-stakes, ensuring that you can have fun without having to break the bank. As with most things these days, finding low-stakes poker games is significantly easier on the internet. In fact, there are few games that the iGaming industry hasn’t produced, whether you’re looking for low-stakes table games or high-stakes bingo. For penny-pinching poker players, there are so many low-stakes poker games that some even offer nano-limits, which are wagers smaller even than a penny sometimes. As we mentioned earlier, there are also a number of free poker games you can get involved in, though be wary of our warnings if you’re an experienced player. To find these games, the easiest thing to do is to Google, as we’re sure a seemingly infinite amount of games will pop up. As for which site you should choose to use, we recommend you practise caution. Don’t just go for the sites with the lowest stakes or the most games, always do your research to ensure that the site is licensed, that they keep up to date with the most recent gambling laws and have other features such as 24/7 customer support. You’re already playing poker on a budget and no one wants to see you lose out on an unlucky site. After all, whether you’re playing low-stakes online or live with friends, the ultimate aim is to have fun. With this guide, we’re sure that you can do this even though you can’t live that baller, high-roller lifestyle of our dreams.